This little place (and I do mean little) is a refreshing surprise. It's tucked away in the same dumpy shopping center as Mai Thai. Today I actually counted the seats...28. Usually you're waited on by Brenda. She's a very nice and attentive lady who makes your experience extremely pleasant. Today she wasn't there but we had an equally excellent waitress. We asked her if Brenda is still there. Turns out this young lady ( I hate that I can't remember her name) is Brenda's daughter and she works on the weekends so her mom can have a break. I can tell you this: she scored BIG with us today. One of my dad's pet peeves (which is now one of my pet peeves) is when a waiter asks "are you still working on that?" Working on it? Really? Where did this ridiculous jargon come from? Well, today, this polished and professional waitress said to my mom, "Would you like me to take your salad plate, or are you still enjoying it?" All three of us locked eyes. Now, THAT'S what we like to hear. On to the food. 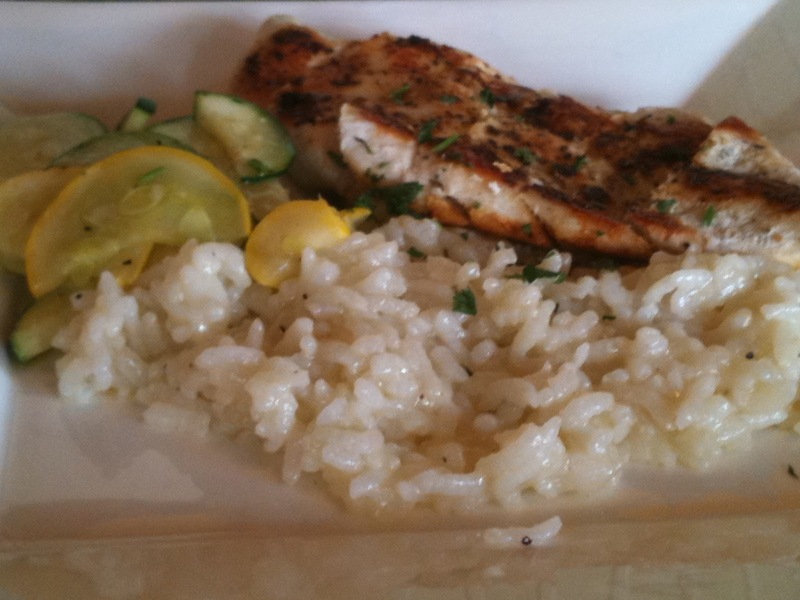 Dad ordered the grilled chicken over risotto. Mom chose a Caesar salad and lasagna with ground beef (they also make one with chicken). I chose an item that I've looked at many times before on the menu, but have never actually ordered. The Parma Panini. I made a great choice. First, dad's chicken came out beautifully. It was pretty, had a nice grilled appearance and according to dad, was remarkably tender and flavorful. This is major because my dad pretty much only eats chicken under duress. Having grown up seeing dirty, icky chickens running around his grandmother's yard and then a few hours later on the table kinda messed with his head. 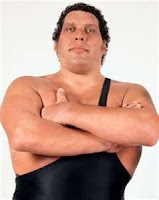 But, now that he is the poster child for health and good eating, he makes himself choose chicken from time to time. He was extremely complimentary of this dish. He went on to say that the risotto was prepared perfectly. One other significant comment: not over salted. Dad finds that so many dishes in restaurants these days are salted to death. because the lettuce pieces won't even fit in your mouth? Not the case here. The dressing was just right too...not drowning the salad and the croutons are homemade. Next, was the lasagna. Very attractive presentation and it satisfied mom's lasagna love. If my mom were to ever be offered a "last meal," it'll be lasagna and/or turkey and dressing. The Parma Panini has stared back at me from that menu for a couple years. As intrigued as I was about the ingredients, something always held me back. Today I decided to jump off the cliff and try it. In a word, awesome. It's a panini of turkey, Genoa salami, a slab of rich mozzarella, slices of Granny Smith apple, balsamic vinaigrette and a little mayo grilled to melty marvelousness. 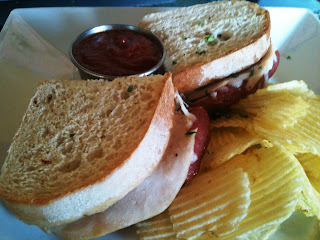 I mean, I really loved this sandwich, people! It was served with chips and a side of their homemade Pomodoro sauce. I wasn't completely convinced about a tomato sauce with this panini, but tried it since they obviously think it works together. I have to agree. I dapped a little sauce on here and there and it really made for a nice flavor combination. The cuteness of this place will win you over too. It reminds me of those little Italian neighborhood restaurants that you see in movies like Moonstruck. Small, familiar, friendly and quality. While I have not had their pizza, I've heard that they are incredible. I saw a couple today having one and it did look very nice. And as they were finishing up "working on it" they told the waitress that it was delicious. That means something. Usually when asked, people say it was "fine." Delicious is a very specific adjective and should be noted. 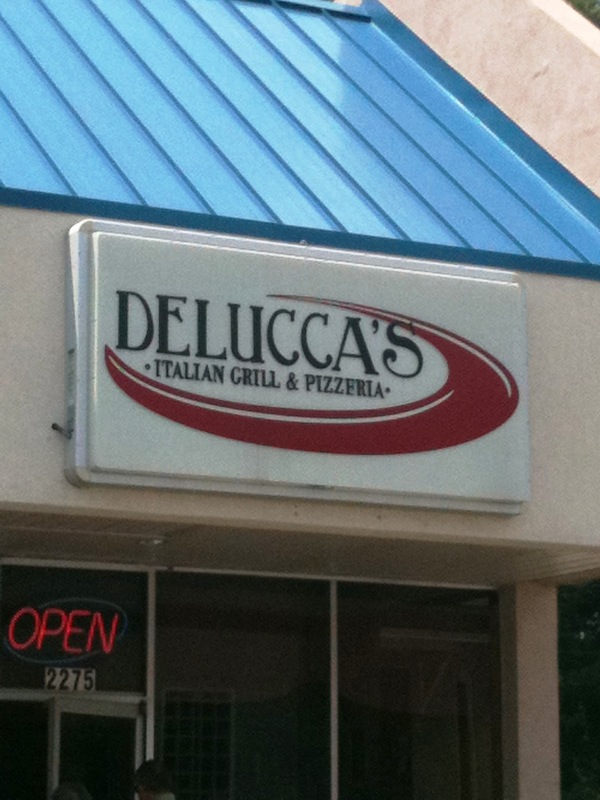 Support locally owned restaurants like Delucca's. Go, eat, tip Brenda or her daughter well and walk away very happy. 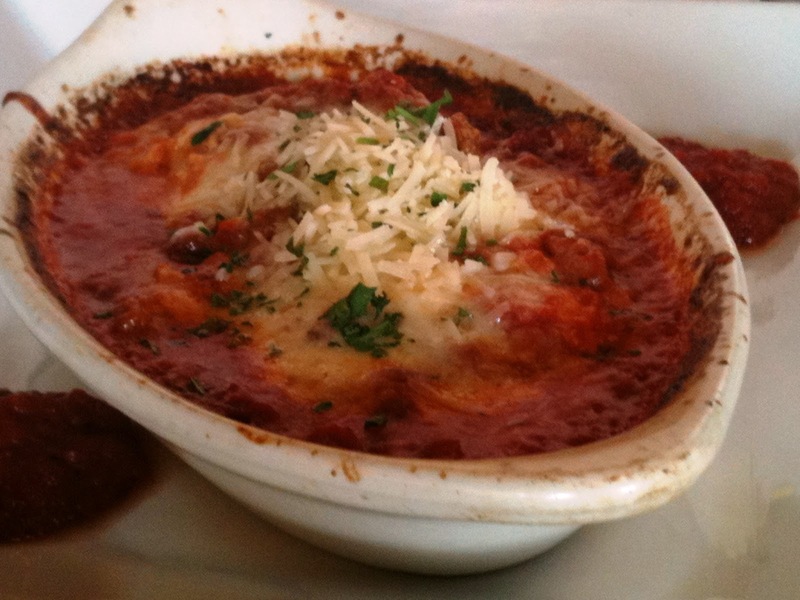 Has your mom tried the lasagna at Nick's on 378? Not sure about Nick's; I'll have to ask her. Delucca's is in that same little shopping center (as Mai Thai) across from Grecian Gardens. It's really a hidden little jewel.